It bears none of the hallmarks of Katharine’s earliest stories: the luxuriant intoxication of the language and mysticism of “Diana of the Inlet” (1912) or the artifice of “Back of Beyond” (1906). In its confidence, ease and maturity, it is far in advance of the romantic fantasies of Windlestraws (1916)… All the evidence of its composition puts The Wild Oats of Han among the novels, short stories and plays of the great flowering of Katharine Susannah Prichard’s literary talent after her return to Australia in the… twenties. Throssell believes that although Prichard wrote a draft in 1908 in the midst of her grief at her father’s suicide, she extensively revised it immediately before its publication. The 1908 draft does not exist; it was probably among the many drafts Prichard destroyed before her death. As a biographer, I wish I could read the original version, as most likely it was even more biographically revealing, with the later revising shaping it further toward fiction. 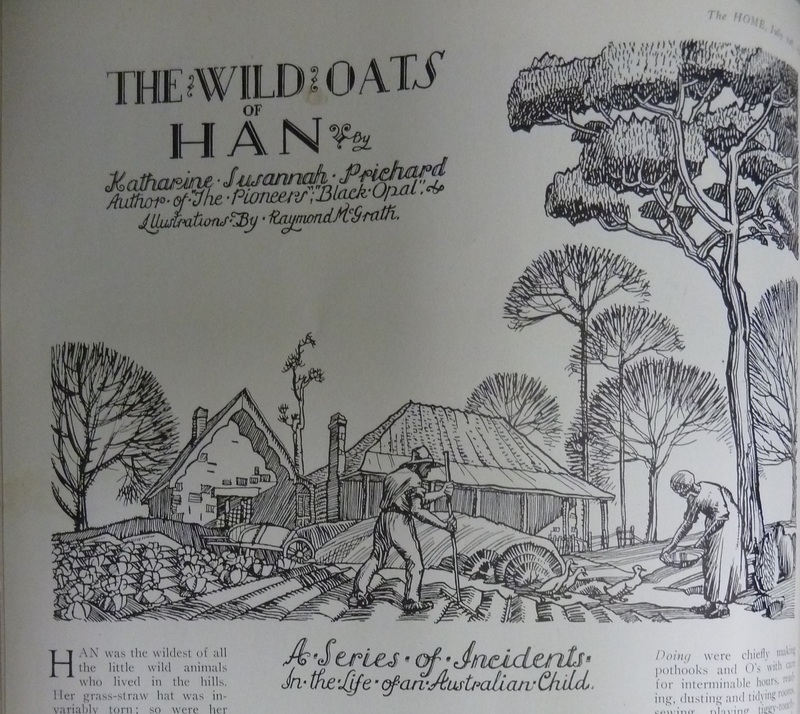 Wild Oats was first published as a serial; it came out in monthly installments in Australia’s Home journal from July 1926 to May 1927. According to Austlit database, Home (1920-1942) was “aimed at the Australian market of middle-class women readers,” and although not renowned as a publisher of literature “is widely admired for its role in the development of graphic art and advertising in Australian magazines.” The first few instalments of Wild Oats are lavishly illustrated, with a painting of Han by Prichard’s cousin, Enid Dickson, and illustrations of scenes by a couple of different artists. The first installment is subtitled “A Series of Incidents in the Life of an Australian Child”, which, although uninspiring, conveys the episodic nature of the book as well as its focus. The illustration to this, reproduced above, is far too agricultural. The novel was not significantly revised before publication by Angus and Robertson in 1928; indeed, some of the errors remain, with ‘access’ for ‘excess’ in chapter one as one example. The ‘revised edition’ of 1968 also only changes a few phrases, despite Throssell noting it was “extensively amended.” The most significantly alterations are in the 1973 American edition published by McMillan, which claims to be the 1968 edition, but has actually been hacked at by someone other than Prichard, who had died in 1969. The entire first chapter is missing, a strange omission when it sets the whole book up very well; a number of other paragraphs have also been omitted. This entry was posted on Thursday, March 5th, 2015 at 8:53 am	and tagged with 1920s, textual history, Wild Oats of Hans and posted in Katharine Susannah Prichard's writings. You can follow any responses to this entry through the RSS 2.0 feed.